Braised Short Ribs With Roasted Beets and Creamy Polenta. Look for reviews on them at some point! Colleen of Slice, Dice, and Dish made Sunny-Side Sausage Fried Rice and Potatoes with Dandelion Greens and Fried Eggs. Chandra of My Way Around the Kitchen made Uptown Sweet and Spicy Sausage Hoagies. Cooking with Court features a review of Rachael Ray's Grilled Cheese Sammies. Lindsey Mae's blog features a good sick day recipe suggestion - Harvest Creamy Corn Soup. The cast of Jersey Shore appeared on Rachael Ray's talk show this week and there are tons of articles about it! Here's one. Cake Mom is giving away a copy of Rachael Ray's Big Orange Book. 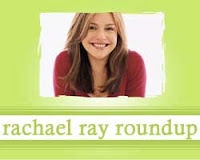 Rachel of Parton Ponderings made a couple Rachael Ray recipes this week, including a Chicken Broccoli Bowl, Shepherd's Pie, and Mint Molten Lava Cake.